Albany Saratoga Speedway Full 8 Sports Marketing: It is Friday night, where else would the 6r team be? Nowhere other than The Great Race Place. Ryan once again drew a high chip for his qualifying race; a 51which started the 6R in the 6th position for the 8-lap heat race. The Heath Racing 6R was fast, and consistent. On the initial start, the bottom line took off while the top line hesitated. Back in the third row, Ryan had to follow traffic on the high side which cost him 2 positions. For the remaining 7 laps, the 6R battled to pick up one position to Cross the line 7th. Ryan would earn a Starting position of 21st in the Feature, which would be cancelled as once again, torrential downpours blanketed the area. 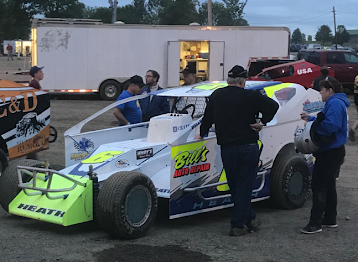 Glen Ridge Motorsports Park Full 8 Sports Marketing: With all of the rain outs in the last few weeks, the Heath Racing 6R headed west again to the Glen Ridge Motorsports Park on Sunday. After coming off a strong 3rd place run their first time at The Ridge, the Heath Racing Team set their sights on the top spot. Ryan was handicap to start last in the heat of 7 cars. Warm ups had shown the Heath Racing 6R was super-fast. The green flag flew and the 6R was off like a rocket. Ryan wheeled the 6R up to the 4th place in the first 4 laps. However, wrong tire choice caused the 6R fade slightly and loose one position. Ryan crossed the finish line 5th in the 8-lap heat. Ryan would roll off 5th in the 20-lap main event. Prior to the feature, the team has switched tires to keep up with track conditions. Right from the drop of the green, Ryan and the 6R started to make their way forward. By half way, Ryan had moved into 4th place. A tough battle with the 02 of David Boisclair would lead to several position changes as Ryan worked to clear Boisclair. By lap 15, Ryan finally cleared the 02, setting his sights on running down the number 3 position as the caution flags flew. This was the opportunity the 6R needed to close the gap with the lead cars. Ryan lined up 4th on the restart. With a good run down the back stretch after the restart, Ryan made a bid to the inside of the 3rd place car, before yellow flags waved again. Ryan fired from the 3rd position on the second restart. The leaders made contact in turns 1&2. The 6R took advantage and dipped below the 2nd place car. The caution would come out for the last time. Ryan Lined up on the outside of the front row for a 3-lap shootout. The 6R and 50 fired together down the front stretch nose to nose. The 50 took a slight advantage through the corner. Ryan managed to stay with the leader but just didn’t have enough time. The Heath Racing 6R crossed the line 2nd with another strong showing at The Ridge. Next Race: Friday June 8, 2018 at Albany-Saratoga Speedway.